Calling the existence of online pharmacies unlawful Mr. J.S Shinde , President, AIOCD announced a nation-wide strike on the 14th of october, 2015, across India during a press conference in Delhi. Mr. Suresh Gupta, Hon Secretary, AIOCD, said, “The government should crack down any online sale of medicines as it raises the risk of misuse of drugs. Presently online pharmacy business is going illegally and govt. authorities are not taking any action against it, hence we have no alternative than to go on strike to protest health of general public. The government’s move toward regularizing the sale of medicines through the internet would increase the risk of adverse drug reaction, which will give an opening for the entry of low-quality, misbranded and spurious products. Entering of low quality products will have major setback economically, which is estimated to be about 8 lakh chemists and about 80 lakh workers and their families. Mr. Sandeep Nangia, President, RDCA, Delhi, says that ‘coming out in support of the nationwide strike called by All-India organization of chemists and Druggists (AIOCD)to Protest online sale of Drugs, more than 12000 chemists and wholesalers in the city will keep their shop closed on October 14 and participate in the protest at Jantar Mantar New Delhi. 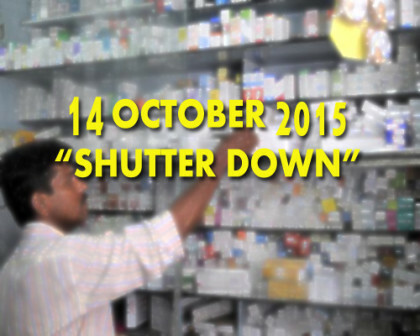 This would be supported by shutter downs by pharmacists in other states as well.